Mexican Independence Day is celebrated on the night of September 15th and all day on the 16th with festive decorations, delicious traditional foods, lively parades, and boisterous patriotic displays. Whether you're celebrating in Mexico or elsewhere, this is the perfect time to celebrate Mexican culture and national identity. Here are some ways you can get into the Mexican patriotic spirit and celebrate Mexico. Any dull occasion will suddenly liven up with the addition of mariachis. Mariachi music originated in the state of Jalisco but is now considered the quintessential Mexican music. Made up of a group of five or more musicians wearing charro suits, a mariachi band lends a festive atmosphere to any event. A live mariachi group is best, but in a pinch recorded music will do just fine. Learn some of the lyrics ahead of time so you can sing along. Learn About the Mexican Flag. The first flag of Mexico was established in 1821, the year Mexico gained independence. The "tricolor" contained the national colors of red, white, and green in diagonal stripes. The colors have remained the same, but their placement and the crest in the center of the flag has changed over time. Each of the three colors has a specific meaning; it is said that the color green represents hope, white is for unity, and red is for the blood of the national heroes. The crest in the center panel is Mexico's coat of arms and portrays an eagle with a snake in its beak standing on a cactus, which comes from the legend of how Tenochtitlan (the Aztec capital where Mexico City is now) was founded. What, drink the flag!? Why yes, Mexicans love things in their national colors (and if it has alcohol in it, then it's all the more festive). There are two ways to do this. You can do a Mexican flag shooter as pictured here with all the colors layered in one shot glass, or if you prefer to keep your colors separate, order a Bandera Mexicana with a shot of lime juice, a shot of tequila and a shot of sangria, as described here: The Mexican Tequila Bandera. Eat a Chile en Nogada. According to legend, this Mexican dish was first prepared by nuns in the city of Puebla just after Mexico's independence was declared. The nuns served the dish to Agustin de Iturbide on his Saints' day (August 28) shortly after the signing of the Treaty of Cordoba which granted Mexico its independence. Its ingredients have the colors of the Mexican flag, making it an ideal Independence Day food. Decorate During the Month of September. Starting at the end of August and all through the month of September, there are vendors selling flags, sombreros, pinwheels and an assortment of other items in the national colors of red, white and green on street corners throughout Mexico. People place flags and banners on their cars, in their windows and anywhere else you can imagine. To celebrate Mexican independence feel free to do the same! Mexican flags, red, white and green streamers, papel picado and other Mexican decorations are all good choices. Learn the Mexican National Anthem. There's no better way to bring out your inner Mexican than by belting out an enthusiastic rendition of Mexico's national anthem. The lyrics of this song were composed by poet Francisco González Bocanegra in 1853; the music by Jaime Nunó was added later, in 1854. The lyrics speak of Mexican victories in battle and defending the homeland. Come on, everybody, sing along now: "Mexicanos al grito de guerra...."
Why leave it to someone else? Throw your own fiesta. You can make sure all the elements are in place if you plan it yourself. Don't forget the decorations, food, drinks, piñatas, and entertainment - how about some mariachi music! And best of all, you have control over the guest list. Mexico's War of Independence was initiated by Father Miguel Hidalgo who called out to the people to rise up against Spain in 1810. This event is known as el grito de Dolores. 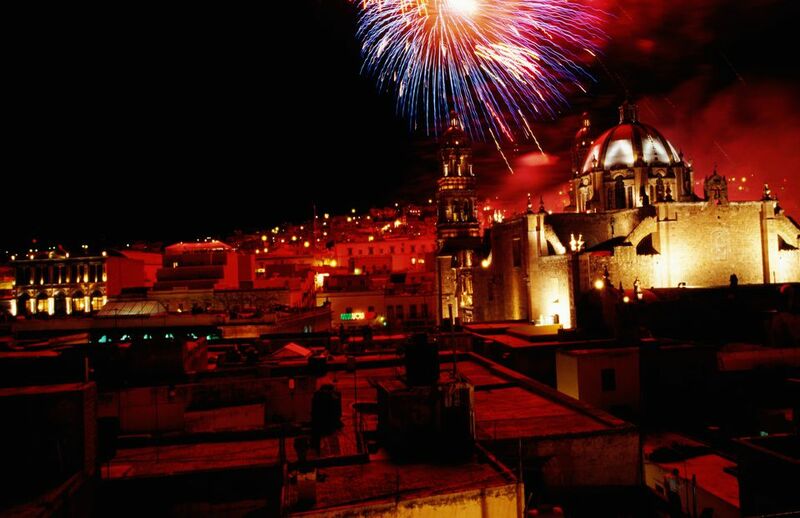 On September 15 at 11 pm el grito is re-enacted in town squares throughout Mexico. If you're in Mexico you shouldn't miss this opportunity to be in the center of the action. If you're not in Mexico, no matter where you are or what you're doing, stop at 11 pm on September 15 and shout "¡Viva Mexico!" at the top of your lungs. Many restaurants, hotels and nightclubs in Mexico put on Noche Mexicana celebrations. These may entail the above items (Mexican food, drink and entertainment), and can vary from fancy hotel dinners and concerts to raucous dance club parties. Or you can just head to the nearest town plaza to join the crowds for el grito at 11 pm and continue partying into the wee hours of the morning. Mexican communities around the world will also be celebrating!